OCO was very thankful to be present at the Launch Event for The Bauta Family Initiative on Canadian Seed Security (BFICSS) held at Everdale on June 8th. Many groups were at the event to celebrate this great national initiative, including the Bauta family, the Weston Foundation, the USC, Everdale, Farm Start, the University of Manitoba, Agro Bio Coop from Quebec, and Seeds of Diversity Canada. The BFICSS addresses the need for seed security in Canada and is possible thanks to generous funding from the Weston Foundation and the foresight and vision of Gretchen Bauta. Gretchen, the daughter of W. Garfield Weston would like to dedicate this project to her parents. The diversity of seeds in Canada is at risk and globally the world has lost 75% of plant diversity in the last 100 years. Only 10% of the remaining varieties are commercially available. Although in Canada we can be proud of our developments of high-quality grains, the commercial focus of our agricultural system has also caused some losses. Canada’s agricultural system is focused on large scale production of very few varieties which are bred for yield, uniformity, performance and thus the genetic diversity has been narrowed and the nutritional value of our food crops has decreased. In addition, much of the seeds are not produced in Canada, forcing Canadian farmers to purchase imported seeds. For example, less than 1% of oat varieties in Canada are in the ground with the rest of the 28,000 varieties in banks, many of which are only present in a volume of less than a quart. Bob Wildfong of Seeds of Diversity Canada, a National Partner of the BFICSS, demonstrated with a jar of Rodney Oats, the only jar of seeds of this variety in the country, the proper method for drying. Once the jar is opened, any small amount of moisture can cause the seeds to begin to germinate and spoil. Thus, the seeds must be sealed in a bucket for a day with an open jar of silica jell which will absorb all of the moisture. To get the lid back on, Bob reached in, using the plastic of the cover as a glove to grab the lid and secure it on the jar without opening the bucket to moist air again. Once dried, these seeds are kept frozen at -7 C with 10% seed moisture and 20% relative humidity. In these conditions, the seeds will last for over 100 years. The BFICSS will build on efforts which have been growing across the country to conserve and commercialize ecologically grown, locally adapted Canadian seed. The BFICSS makes it possible to save seeds and build a framework that until now was not possible. Farms participating in the program are growing and saving seeds of varieties which are not in circulation or which they know grow well on their farm. They are documenting the entire process so that farmers can learn from the each other and the information can help the movement to grow. Everdale is a member and long-time partner of the Organic Council of Ontario. It was started in 1996 and operates on 250 acres near Hillsburgh, Ontario. Everdale is the home for the Ontario Regional Office for the BFICSS and is also participating in saving seeds and expanding the amount of seeds available in the region. Everdale is home to the first publicly accessible seed library in the country, managed by Seeds of Diversity Canada, where gardeners and farmers can request to grow out seed from over 3000 varieties of vegetables and field crops. 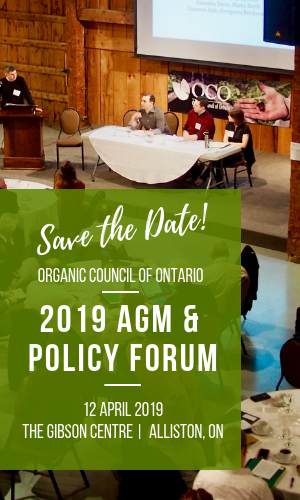 The Organic Council of Ontario is one of the many organizations which have a deep concern and support for the work being done by the BFICSS and is providing guidance wherever possible. In addition, several OCO members including Tom Manley at Homestead Organics and many farms with Organic Meadow have been providing support as consultants to the program. For more information, please visit the new website for the Bauta Family Initiative on Canadian Seed Security.